Vancouver, B.C… Corvus Gold Inc. (“Corvus” or the “Company”) - (TSX: KOR, OTCQX: CORVF) announces positive results from the initial two scout drill holes in the new and previously untested Eastern Steam-heated Zone on its North Bullfrog project. 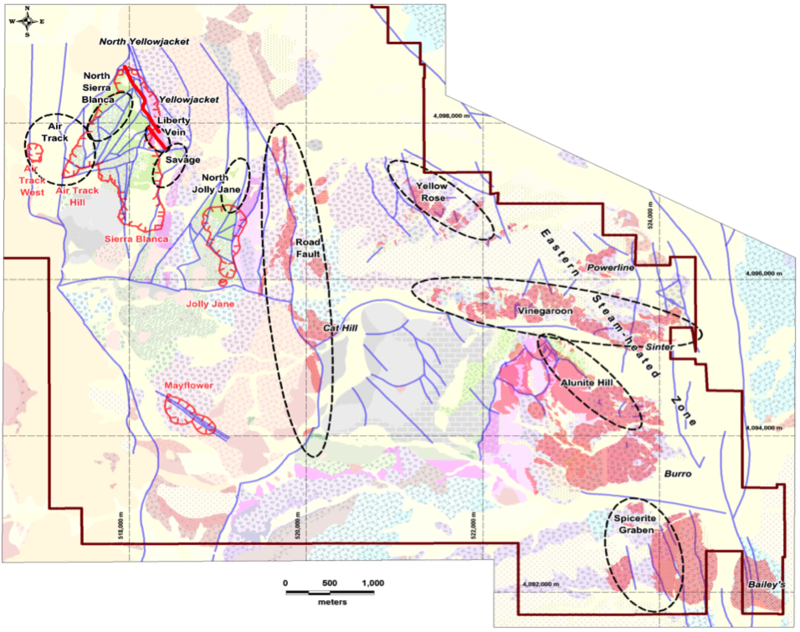 Results from the initial holes in the Alunite Hill target area intersected multiple zones of low-grade gold and silver representing the first confirmation that gold-silver systems are present in this large untested target area (Table 1). Mineralization appears to be directly related to the large outcropping alteration system that currently covers 14 square kilometres along the NNW trending structural zone. The first pass scout drilling in the Eastern target area drilled six holes in three of the eight targets to be tested in 2015 (Figure 1). 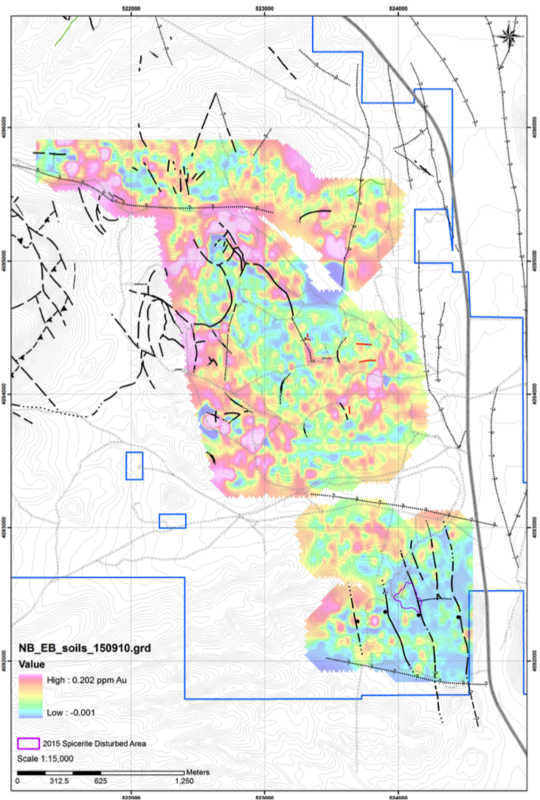 In addition, final results from an initial soil survey of the East Bullfrog structural belt returned a number of surface gold and silver anomalies which correlate with known, large structural zones and are enhancing targeting for follow-up drilling (Figure 2). The ongoing 2015 drill program is targeting new vein systems as well as the expansion of the YellowJacket deposit in the Western Resource Area (WRA). Four to five targets in the WRA will be drilled before returning to the East Bullfrog belt for follow up and new target testing. The initial two scout holes into Alunite Hill intersected a shallow (~350) west dipping structural zone with characteristic high level alteration and scattered zones of thin stockwork veining. The low angle, west dipping nature of the structural zone is analogous to the major controlling structural zone at the historic Bullfrog mine to the south which also had scattered low grade gold and silver intercepts distal to the main ore body. The low grade gold and silver mineralization is also similar to the distal parts of the YellowJacket deposit in particular with broader areas of silver mineralization generally surrounding gold mineralization. In addition the occurrence of silver to gold ratios of about 10-1 is a good indicator for mineral systems that have potential for high-grade, YellowJacket type vein systems. The current vectors from these initial two holes and the surface soil results would indicate hotter and better grade parts of the system would be to the NW which is emerging as a strong follow-up target. Figure12. North Bullfrog District scale target map. Figure 2. East Bullfrog area gridded gold in soil map with hotter colors representing higher gold values. WhittleTM optimization using all cost and recovery data and a breakeven cut-off grade of 0.15 g/t. This press release contains forward-looking statements and forward-looking information (collectively, “forward-looking statements”) within the meaning of applicable Canadian and US securities legislation. All statements, other than statements of historical fact, included herein including, without limitation, statements regarding the anticipated content, commencement and cost of exploration programs, including the potential targets and ongoing drilling for the 2015 drill program, anticipated exploration program results, the discovery and delineation of mineral deposits/resources/reserves, the potential to develop multiple YellowJacket style high-grade zones, the Company’s belief that the parameters used in the WhittleTM pit optimization process are realistic and reasonable, the potential to discover additional high grade veins or additional deposits, the potential to expand the existing estimated resource at the North Bullfrog project, the potential for any mining or production at North Bullfrog, business and financing plans and business trends, are forward-looking statements. Information concerning mineral resource estimates may be deemed to be forward-looking statements in that it reflects a prediction of the mineralization that would be encountered if a mineral deposit were developed and mined. Although the Company believes that such statements are reasonable, it can give no assurance that such expectations will prove to be correct. Forward-looking statements are typically identified by words such as: believe, expect, anticipate, intend, estimate, postulate and similar expressions, or are those, which, by their nature, refer to future events. The Company cautions investors that any forward-looking statements by the Company are not guarantees of future results or performance, and that actual results may differ materially from those in forward looking statements as a result of various factors, including, but not limited to, variations in the nature, quality and quantity of any mineral deposits that may be located, variations in the market price of any mineral products the Company may produce or plan to produce, the Company's inability to obtain any necessary permits, consents or authorizations required for its activities, the Company's inability to produce minerals from its properties successfully or profitably, to continue its projected growth, to raise the necessary capital or to be fully able to implement its business strategies, and other risks and uncertainties disclosed in the Company’s 2013 Annual Information Form and latest interim Management Discussion and Analysis filed with certain securities commissions in Canada and the Company’s most recent filings with the United States Securities and Exchange Commission (the “SEC”). All of the Company’s Canadian public disclosure filings in Canada may be accessed via www.sedar.com and filings with the SEC may be accessed via www.sec.gov and readers are urged to review these materials, including the technical reports filed with respect to the Company’s mineral properties.